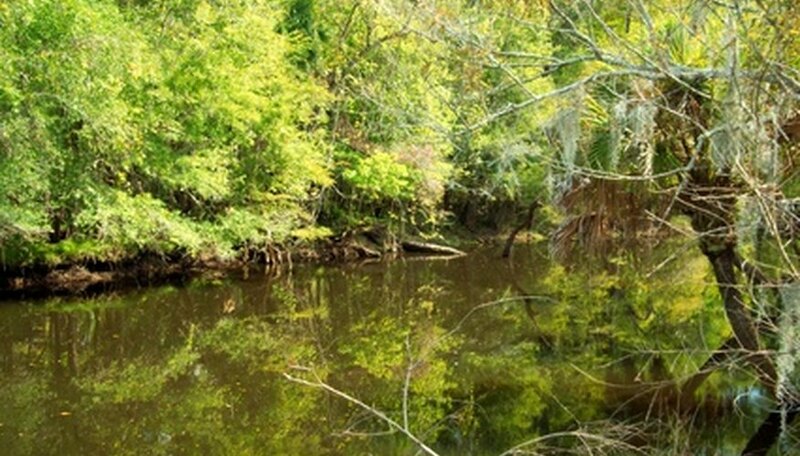 The state of Florida offers more then eight distinct ecosystems, according to the University of Florida. This offers a diverse range of tropical plant choices. 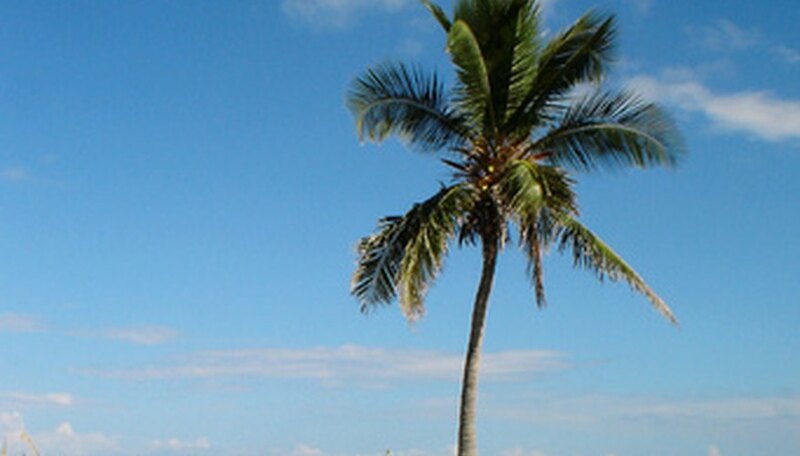 The southern to central region of Florida is considered to be tropical in nature and the northern part of the state is considered sub-tropical. Exotic tropical plants flourish to such an extent that they have naturalized in forest settings. Currently there are over 1,300 varieties of tropical plants that were imported throughout the years into Florida and have spread into the state's woodlands. 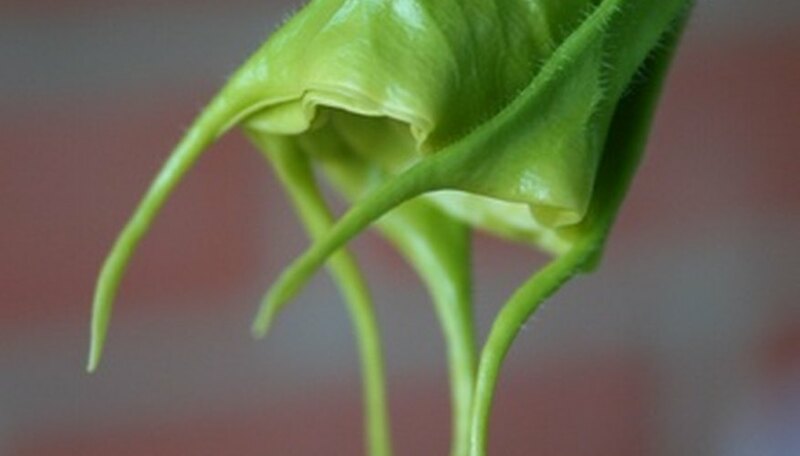 The angel trumpet (Brugmansia suaveolens) can be successfully grown as a shrub or a tiny single stemmed tree. The leaves of the plant are huge and can measure up to 6 inches across and 10 inches long. If the plant is grown in the shade, then it will produce even larger leaves. Flowers are 12-inch-long, white, trumpet-shaped blossoms that have a pleasantly sweet fragrance. There are varieties available that produce pink and yellow flowers. Each flower hangs almost straight down in a very pendulous fashion. The plant flourishes in southern and central Florida gardens. In the northern part of the state it can be successfully grown in a container and moved indoors if there is a danger of severe frost. Top flower production requires that the plant be in full sun but it can flourish in partial shade with diminished flower production. The angel trumpet grows as an evergreen to approximately 8 feet in height. The plant is poisonous if consumed. The South American air plant (Kalanchoe fedtschenkoi) is grown in rock gardens and as a ground cover from southern Florida to parts of central Florida. In areas of the state that suffer from the occasional freezes, such as the northern part of the state, the plant can be grown as a container and moved indoors during a freezing night. The South American air plant is considered to be a perennial succulent, which means that it stores water in its fleshy foliage. The leaves are a bluish green in color. The plant does blossom with tiny purple flowers from upright stems. The plant has become firmly established in the forests of southern Florida. The lion's ear (Leonotus leonurus) can successfully be grown in all parts of Florida. In the northern part of the state the plant will often be killed to the ground by a hard frost but will return when the weather warms. The plant produces unique 2-inch-long tubular orange flowers on upright stems. The plant will grow 6 feet tall with a spread of up to 4 feet. The leaves of the plant are pleasantly fragrant. This is a popular flower to grow in a garden to attract butterflies. The lion's ear can be grown in coastal gardens because it does tolerate moderate amounts of salt. Grow in full sun for best flowering results. The Bolivian sunflower (Tithonia diversifolia) has the appearance of a general sunflower. It can be successfully grown in all regions of Florida. If the plant is hit by a hard freeze it will be killed to the ground but return successfully if the frost is not extended. The plants grow 16 feet tall with a spread of 12 feet. The flowers can be up to 6 inches across. Flower fragrance is similar to honey and attracts both bees and butterflies to the garden. The plant has escaped cultivation into the forest setting of Florida where it grows in abundance. In areas that have a large population of deer and squirrels the plants can be difficult to grow because the wildlife will readily consume leaves and flowers. Why Are the Leaves Falling Off My Indoor Plant?